Japanese Hand Craft owner blog: Do you like SAKE? Sake is a Japanese alcoholic beverage made from rice. but the characterization implied is not accurate. Wine is made from the single fermentation of plant juices. which is more similar to how beer is produced. It is nomal sake. It is like a table wine. The other four kinds are premium sake. A slight amount of distilled alcohol is added. The distilled alcohol helps pull some extra flavors out of the mash. It is made from rice only. 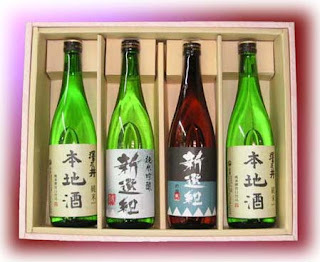 At least 40% of the rice is to be polished away and no alcohol is to be added, if the sake is to be considered junmai. Rice weight polished to 50% or less. Rice weight polished to 40% or less. So, it has all the nuances of wine!